For the past eight years, more and more finesse anglers have become keenly aware of the effectiveness of the finesse-size soft-plastic baits that John Crews of Salem, Virginia, and his staff at Missile Baits have created. And when Crews introduced the Bomb Shot to the angling world in June, it caught the attention of a goodly number of Midwest finesse devotees and scores of other black bass anglers. In fact, Byron Childers of Salem, Virginia, who is Missile Baits’ director of sales, said during an Aug. 22 telephone conversation that sales of the Bomb Shot have been exceptionally brisk, and the production of some of the colors cannot keep pace with the demand. 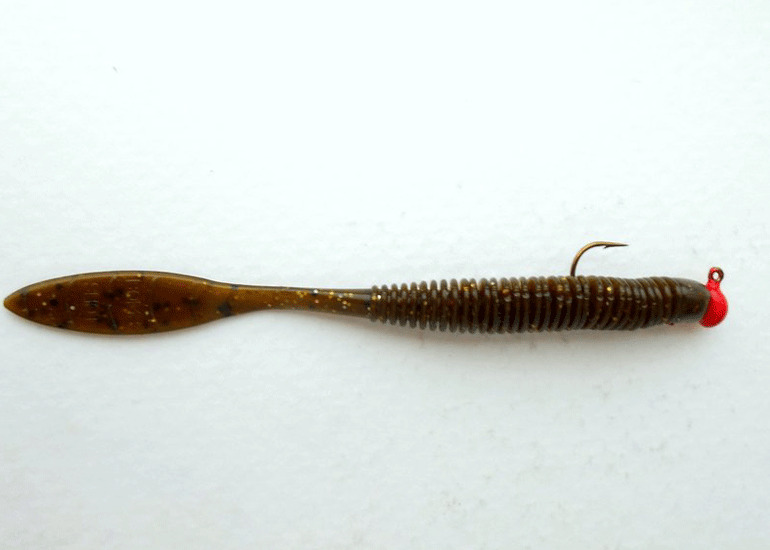 The Bomb Shot is four inches long, and it was designed as a drop-shot bait. Drop-shot rigs, however, are not part of the paraphernalia that Midwest finesse anglers employ. So instead of using it on a drop-shot rig, they will affix the Bomb Shot to a small mushroom-style jig with an exposed hook. And some of the old-timers in the Midwest finesse clan might wield it on a split-shot rig. Its head is three-sixteenths of an inch long, a quarter of an inch wide at its widest spot with a circumference of three-quarters of an inch. It is half-oval shaped, but some folks will describe it as bullet shaped. Immediately behind its head, the Bomb Shot is embellished with a ribbed torso that is 1 3/4 inches long. The ribbed torso is five-sixteenths of an inch wide at its widest spot with a circumference of 1 1/16 inches. It is encircled with 31 significant ribs, and the biggest rib has a radius of an eighth on an inch. These ribs exhibit a subtle pulsating motif. The size of the ribs and the width and circumference of the torso becomes smaller as it merges with the section of the torso that is devoid of ribs. The portion of the torso that is devoid of ribs is smooth-skin, and it is a half of an inch long. At the junction of the ribbed section and the smooth section, it is three-sixteenths of an inch wide. At the junction of the tail, the smooth-skin section of the torso is an eighth of an inch wide. The entire torso in oval shaped. Its tail is flat and 1 1/2 inches long and three-eighths of an inch wide at its widest spot. It possesses a marquise shape. Both sides of the tail are embossed with six minute ridges that stretch from one edge to the other edge, and they are about one-eighth of an inch apart. Between three of the ribs, the words Bomb Shot are imprinted on one side of the tail, and they are situated between three of the ribs. It is available in the following colors: Bombshell, Fisholicious, Goby Bite, Green Pumpkin, Green Pumpkin Flash, MM3, Pinkalicious, Super Claw, and Watermelon Red. A package of 15 costs $3.99. When a Midwest finesse angler affixes the Bomb Shot on a small mushroom-style jig with an exposed hook, they will be able to employ it with all six of the standard Midwest finesse retrieves or slight variations of those retrieves, which makes it a much more versatile bait than when it is affixed to a drop-shot rig. What’s more, some Midwest finesse anglers are likely to find that this handsome and delicate soft-plastic bait has some similarities to a shad-shaped worm, which has been part of their repertoire since Shin Fukae of Osaka, Japan, and Palestine, Texas, introduced us to it on April 1, 2006. The Bomb Shot, however, is more of a minnow-shaped worm than a shad-shaped one. 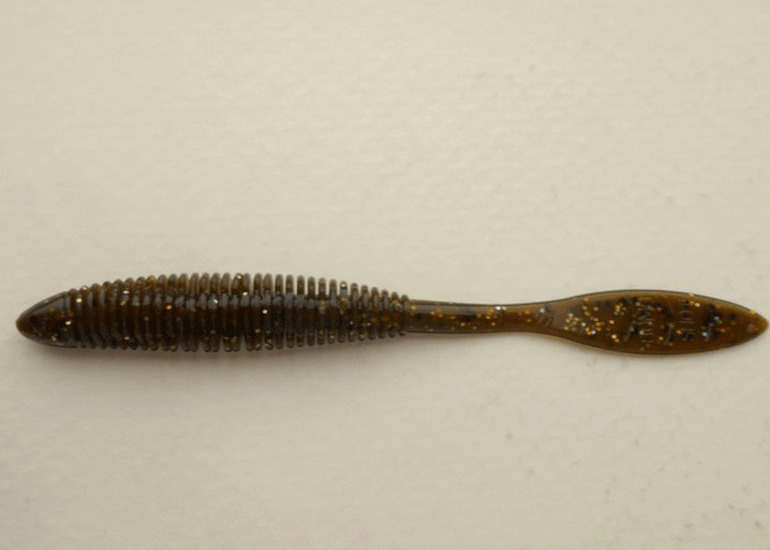 A Missile Baits' green-pumpkin Bomb Shot affixed to a red 1/32-ounce mushroom-style jig. It is exceptionally buoyant, and the buoyancy and its flat tail will enhance the Midwest finesse angler’s swim-glide-and-shake presentation. There will be some debates among Midwest finesse anglers about the best way to rig it onto a small mushroom-style jig with an exposed hook. Some will prefer to have the tail so that is it situated in a horizontal motif. Others will prefer a vertical motif. And there might a few mavericks who will affix it a touch catawampus. (1) Here is a link to Missile Baits’ website: https://missilebaits.com/. (2) Here are links to previous Midwest Finesse columns about Missile Baits: //www.in-fisherman.com/bass/missile-baits, which was published on May 22, 2014; //www.in-fisherman.com/midwest-finesse/missile-baits-craw-father/, which was published on June 23, 2018. (3) Here is a link to the Midwest Finesse column that describes how to employ the six standard Midwest finesse retrieves: //www.in-fisherman.com/midwest-finesse/six-midwest-finesse-retrieves/. (4) Here is a link to a Midwest Finesse column that features the finesse tactics that Shin Fukae employed on April 1, 2006: //www.in-fisherman.com/midwest-finesse/six-midwest-finesse-retrieves//.